What electrified me about the Czech musicians was the tremendous skill level. They're influenced by the same players as we are. 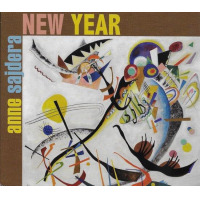 Anne Sajdera’s remarkable acumen as both a pianist and a composer finds rejuvenation on New Year, set for November 2 release on her own Bijuri Records. The album hits close to home for Sajdera—her ancestral home, that is, of the Czech Republic and its storied capital, Prague. A 2014 trip to Europe’s “Golden City” was the catalyst for the album’s creation. Sajdera’s journey wasn’t planned as a musical one. While in Prague, however, she encountered trumpeter/flugelhornist Miroslav Hloucal and alto saxophonist Jan Fečo, who became her chief collaborators on New Year. In addition to supplementing her working San Francisco trio (bassist Gary Brown and drummer Deszon Claiborne) and other special guests with their sparkling instrumental work, Hloucal and Fečo brought in four of the album’s nine tracks. “What electrified me was the tremendous skill level,” explains Sajdera (pronounced sazh-dair-uh). “I don’t think there are many Czech jazz musicians who want to say, ‘This is Czech jazz’ the way Brazilian musicians would refer to ‘Brazilian jazz.’ They’re influenced by the same players as we are.” Indeed, New Year’s music is firmly in the vein of acoustic post-bop: sophisticated, straight-ahead, and thoroughly swinging. Even “It Depends on That,” Fečo’s stellar arrangement of a Roma folk song, feels perfectly at home in the 21st-century jazz repertoire with its deceptively jagged rhythms and sumptuous harmony. Likewise, Hloucal’s trio of melodic delights—“Pictures,” “Butterfly Effect,” and “Changeling”—positively simmer in straight-ahead seasoning. In the case of the urgent, album-opening “Pictures,” tenor sax luminary Bob Mintzer’s vital, muscular work adds an extra ingredient to that seasoning. Sajdera’s five original compositions naturally provide the backbone of the album, and rival Hloucal and Fečo’s contributions in their freshness and craftsmanship. Her haunting romantic ballad “Treasure” also highlights Sajdera’s ambition: It doesn’t include the Czech musicians, but does expand her trio to include flugelhornist Erik Jekabson, alto saxophonist Lyle Link, flutist Rita Thies, and violinist/cellist Joyce Lee. Link and Jekabson also appear on “Bright Lights,” a bare-bones platform for improvisation that’s both taut and joyful. The album also includes a live rendition of “Azul,” the dreamy samba reggae title track to Sajdera’s 2012 debut album, here balancing sensitivity with astonishing rhythmic assurance. Born in Portsmouth, Virginia in 1965 to a military family, Anne Sajdera grew up in San Diego. Piano lessons as a child led her to form a tight circle of musical friends who often gathered to play together. She maintained a steady diet of Chopin waltzes, Bach inventions, and Beethoven sonatas in her piano studies, but at the age of 13 became intrigued by Chick Corea’s My Spanish Heart. After relocating to the Bay Area in 1985, she auditioned at the San Francisco Conservatory of Music and was accepted as a piano performance major, switching to a composition major at the end of her sophomore year. Sajdera’s investigation of jazz took off when she began a relationship with an accomplished jazz guitarist, with whom she was soon playing casuals. A class at Berkeley’s Jazzschool with the great Brazilian pianist/composer Marcos Silva sparked her enduring passion for Brazilian music. Before long she was gigging around the Bay Area with her own band Pelo Mar, and as an original member of Bat Makumba. 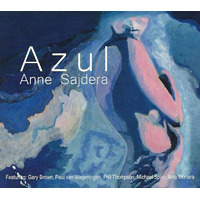 Her debut album, 2012’s Azul, also reflects this deep and abiding passion, mixing her ravishing original pieces with classic tunes by the Brazilian masters. It received a place on one of Jazziz magazine’s 2012 Critics Polls and was named one of Latin Jazz Corner’s Great Latin Jazz Albums that same year. It was in 2015, in the spirit of International Jazz Day, the project launched by Herbie Hancock in his role as UNESCO Goodwill Ambassador, that Sajdera began to connect the Czech jazz scene to the Bay Area scene. After she produced a pair of pilot concerts featuring sax virtuoso Karel Růžička and organ maestro Ondre J, two Brooklyn-based musicians who originally hailed from the Czech Republic, the plan to collaborate in the studio with Jan and Miroslav began to take shape. Anne Sajdera will be performing a series of CD release shows, all featuring Miroslav Hloucal and Jan Fečo, in November: Fri. 11/2 Savanna Jazz, San Carlos (8pm); Sat. 11/3 Piedmont Piano Company, Oakland (8pm); Mon. 11/5 Luna’s Café, Sacramento (7:30pm); Fri. 11/9 Café Pink House, Saratoga (7:30pm); Sat. 11/10 Hotel Healdsburg, Healdsburg (6:30pm).